"We're living on a dream right now, praying that this is going to be successful. So far, it has been." The emphasis on the ingredients at Sessions is a big part of what drives the restaurant forward and what draws customers in - the trends of the 2010s have been to focus on local, artisan components. With freshly baked bread from OC Baking Company, locally grown vegetables, and great meats, Sessions seeks to give a culinary experience for a product that many eat but not as satisfactorily as they could there. Matt pointed out that the sandwich is a common go-to food for the southern Californian sporty lifestyle whether you are out at a park, on the beach, in the snow, or somewhere else but your options are limited - "People eat sandwiches because they know they have to eat so they'll get $5 foot-longs or go to a gourmet place, paying $13 or $14 for a sandwich that doesn't travel well." Inspired by the rapid growth of the Wahoo's Fish Tacos restaurants and Chronic Tacos chain, Sessions is designed to expand in the same manner but with the look and feel of 2014 both in food quality and modern design. The food is a combination of help from a food consultant and the base flavors that Matt has found most people crave. "People want to be wowed. They want to have more of an experience so we make all of our sandwiches gourmet but priced affordably. Sandwiches are lacking depth in other places; you can tell the quality of their ingredients are good but there isn't an experience." 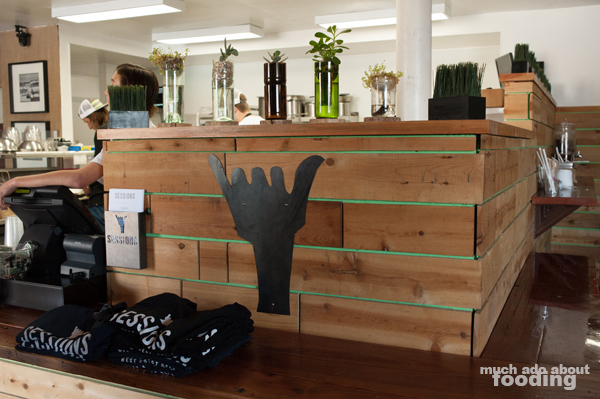 Their logo is the ever-familiar "shaka" - a symbol ubiquitous to southern California, athletic adventure seekers, and "session"ers (those who surf, skate, snowboard, ski, and so forth). It represents the lifestyle and pride of the West Coast and easily gives visitors an idea of what to expect. Oh and the design? The product of Matt's own drive and handiwork. 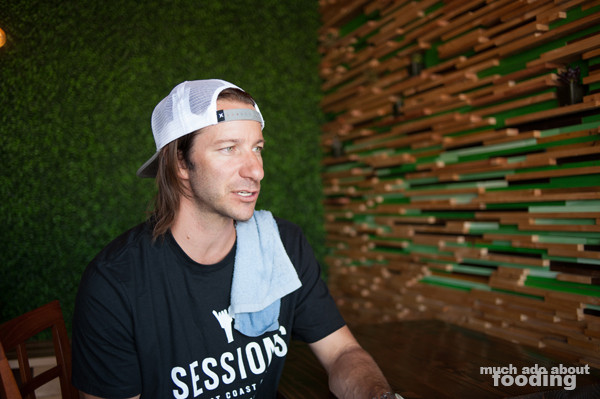 As a new business started up on limited funds, Sessions got a little more personal hand-built experience as tears and sweat were shed over its construction. He had to learn how to build. Every chair, table, and other piece of furniture was personally made. 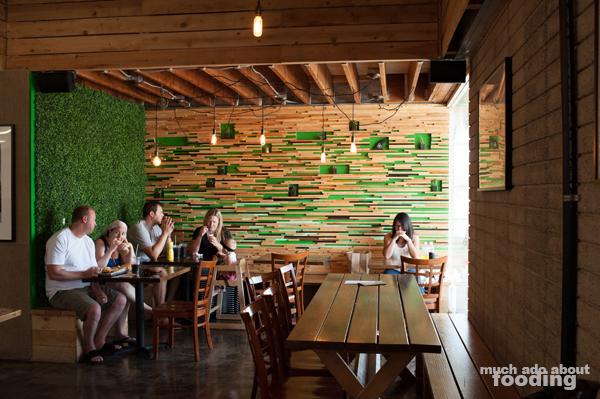 Most impressively was the staggered and one-of-a-kind wall which we sat in front of; three 12-hour days were spent layering strategically painted scrap wood to form an iconic Sessions wall that will prove to be the branding point of the soon-to-be sandwich chain. "If it's going to be crunchy, it'll be crunchy; if it's going to be spicy, it's GOING to be spicy. None of this middle of the road thing." Sessions serves both breakfast and lunch with breakfast menu items priced from $3.50 to $7 and served until 10:30am. Most of the breakfast menu is made up of bagel sandwiches featuring Shirley's Bagels with coffee by Kean Coffee. Lunch is composed of hot and cold sandwiches, 12" all beef jumbo hot dogs on poppyseed-potato rolls, salads from $5-$9 (the most popular is the Thai Cobb), and sides purchasable in half or full pint sizes. We were mostly focused on the lunch menu because the restaurant was focused on that. 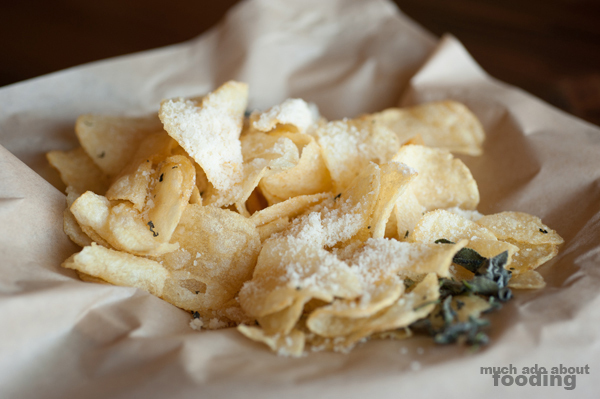 To start, we tried the Shaka Spuds ($2 - potato chips with sage, rosemary, and Parmesan) and German Potato Salad ($2.5/$4). 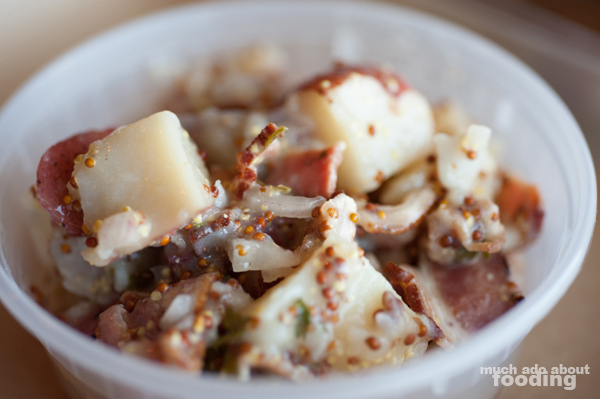 Because neither the chef nor Matt likes mayonnaise, the potato salad was done in German style which meant no mayo but plenty of pickled mustard seed. The potato chips crunched loudly and satisfactorily, emitting fragrant herbal scents and tastes from the fried and dried herbs. These were nice touches. The potato salad had potato chunks a touch stiffer than my preference but the dressing was refreshingly tangy. 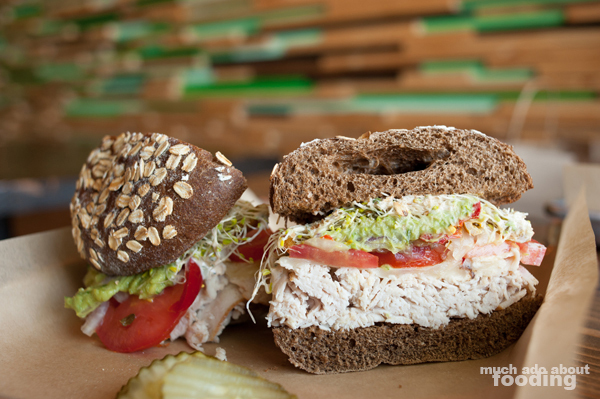 Their most popular sandwich also happens to be one named after Matt himself - the Meddock Melee ($9 - roast turkey, jalapeno jack, guacamole, razor onion, tomato, cherry pepper, sprouts, and adobo-buttermilk dressing on a toasted squaw roll). It seems just about the safest choice as in the barest description, one could call it a spicy turkey sandwich. 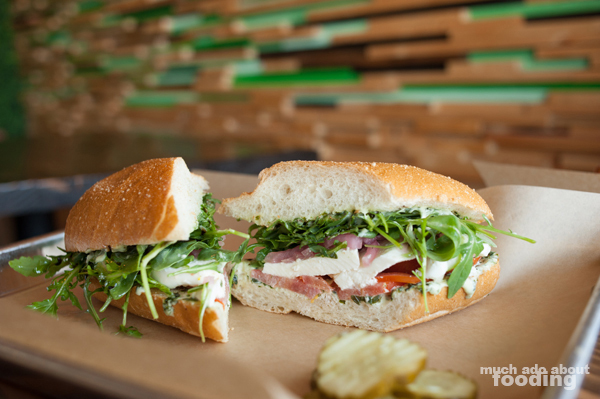 It was the very first sandwich the founder envisioned, and it is quite the tall mouthful. I couldn't even get a full bite into it and required the assistance of a fork. Piled high with fresh ingredients, this is a great starter sandwich with turkey meat sliced so thinly that it practically melted in your mouth. The peppers gave it an unexpected spiciness which mellowed out through the guacamole. I particularly enjoyed the crunch from the sprouts on this one. 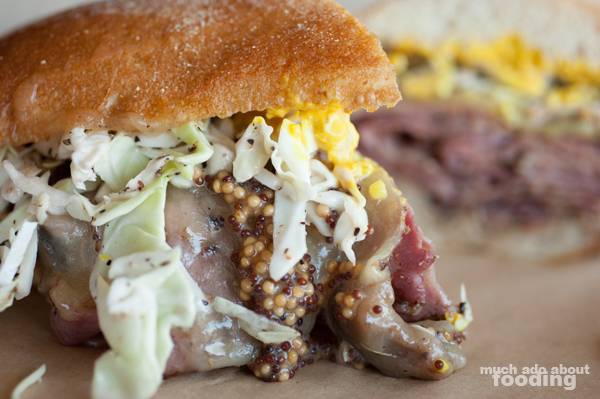 Meet The 'Strami ($9.50 - pastrami, Swiss, pickled mustard seed, chow chow, and slaw on toasted ciabatta), a solid pastrami sandwich that many regulars at Sessions claim is the best one they've ever had. The slaw is made to order so that it doesn't sit and turn soggy in its dressing. 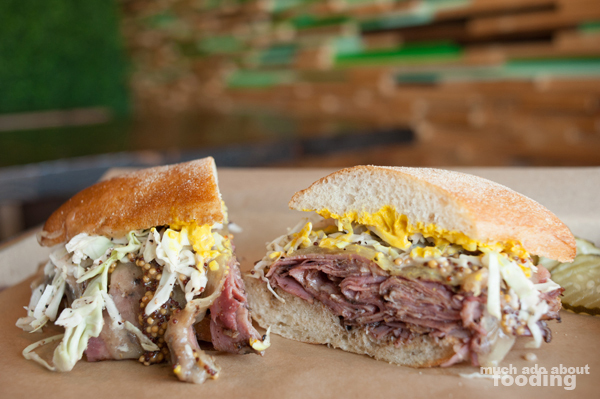 Thinly sliced and oozing with flavor, this pastrami is a meaty masterpiece. Was it the best pastrami I've ever had? Not quite but it certainly felt like the healthiest and cleanest one I've had; the meat was not overly fatty nor messy and the slaw's crispness tied everything together. My absolute favorite sandwich from the visit was Sessions' Summer Zephyr ($8 - fresh mozzarella, marinated tomato, basil aioli, baby arugula, pickled onion, and balsamic reduction on a toasted French roll), their vegetarian option named after Matt's wife. They particularly enjoy when carnivorous customers come in claiming they only eat meat but end up choosing the Summer Zephyr as their go-to. The first part of this sandwich that caught my undivided attention was the fantastic French roll. Its snap and crackle per bite was music to my ears. Then came the heft and meatiness of the thick slabs of mozzarella which had no problem replacing the spot where meat would have fit in. Dressed baby arugula also gave a crisp that was softened by the dressing and sweetly sour balsamic reduction, and the tomato refreshed each bite with juices. I highly recommend this sandwich no matter if you are a strict meat eater or not. 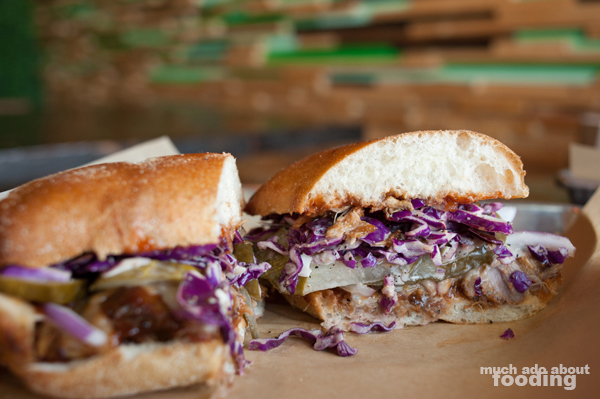 Matt's favorite is the Sloppy Barney ($9 - pulled pork, sweet & sour BBQ sauce, pickle, red onion, jalapeno jack, and SoCal slaw on ciabatta) which he likens to the solid sandwich for those seeking both pulled pork and BBQ. 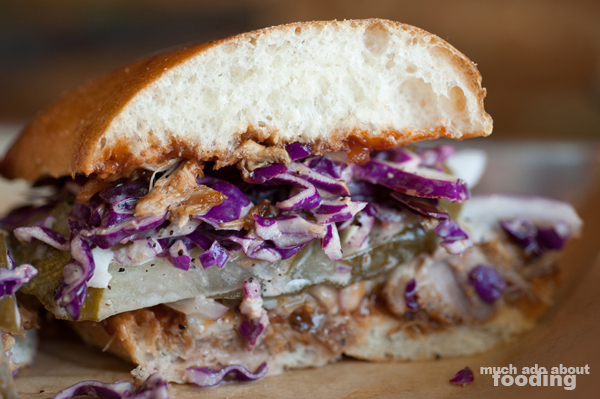 We wondered why it was called the Barney, and his winked answer was because of Barney the purple dinosaur and the sandwich's red cabbage. Perhaps it was also because "barney" is slang for an outsider too. This is a messy, wipe-your-face-after-every-bite sandwich. 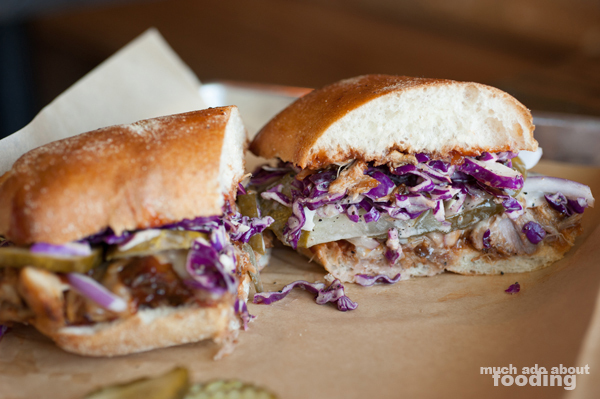 Dripping with tangy, balanced BBQ sauce and peeling away with pieces of pulled pork per bite, the savory sandwich can be both a lunch indulgence or a dinner delight. It was easily Duc's favorite. We didn't try it this time but I am looking forward to getting the Greatfella ($9 - smoked ham, capicola, Genoa salami, Provolone, chow chow, razor onion, cherry pepper, shredded cabbage, and herb vinaigrette on toasted ciabatta) next based on the quality of sandwiches we've already tried. 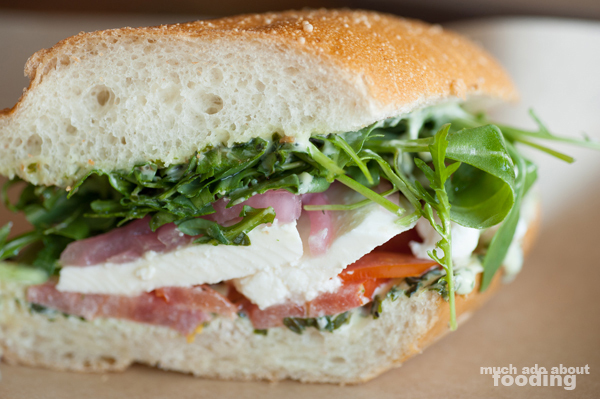 Nothing quite beats a good Italian sandwich for me! Take a look at their sandwiches which touch on all of the classic cravings - which would you dig on? Find them at 2823 Newport Blvd in Newport Beach and rock on, fellow southern Californians!